‘Beer of the Month’ is a regular series where our editors sample a unique craft beer. 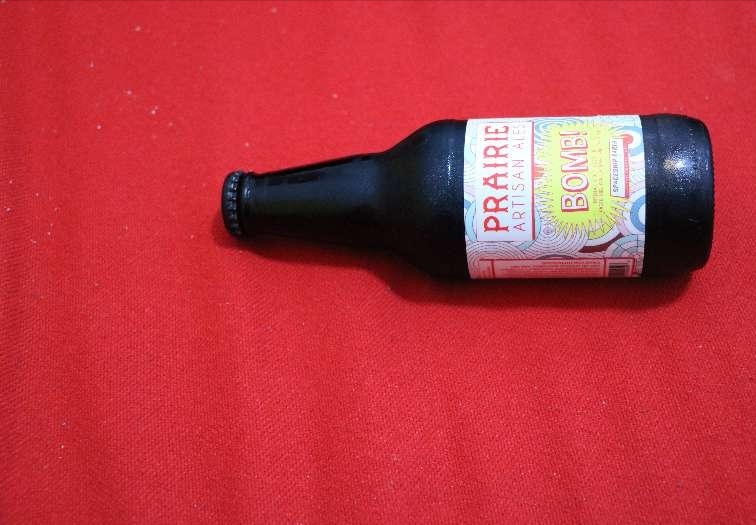 This month, our Shenzhen editorial team sampled Prairie Artisan Ales' spicy ‘Bomb!’ stout! Spice is just part of the package when living in China. Everywhere you go, you’ll see Lao Gan Ma’s benevolent face beaming at you, seemingly suggesting that you amp-up that Snickers bar you just bought with a touch of her zesty paste. While we’ve adapted to, and even embraced, the spiciness of various Chinese regional cuisines, dishes and dips, we have to admit we were a bit perplexed last month when we came across a US-brewed ‘spicy stout’ while browsing Taobao. The beer, brewed by Prairie Artisan Ales in Oklahama in the US, is called ‘Bomb!,’ and is crafted using cacao nuts, vanilla extract and, you guessed it, chili flakes. Forever curious, we ordered a couple of bottles of Bomb!. When the beverages arrived at our office, we were surprised to find that the beer boasts an astounding 13 percent ABV, enough, we thought, to quickly unshackle the doors of inebriation and banish sobriety for a couple of hours. We cracked open the bottles and poured the brown, boozy elixir into plastic cups (for sharing, of course). Aesthetically, Bomb! is by no means a pleasing sight. One member of our editorial team commented that the imperial stout looked more like soy sauce than anything else, while another suffered some unfortunate flashbacks of gruesome childhood cough syrup experiences. Our first sip was, and we are not exaggerating, a combined explosion of both taste and mouthfeel. Being Guinness drinkers, we were not particularly ready for the carbonated liquid that met our tongues, and when combined with the whole range of flavors that we listed above, we had to take a moment to steady ourselves. Ensuing sips summoned a very wide variety of reactions. Chocolate was mentioned at one point and coffee had more than its fair share of airtime. We even had one very peculiar reference to a rare, old tonic wine called Buckfast, a comparison attributed to the fragrant, herbaly aftertaste that the brew leaves on the palate. While that initial sip may have been worth a week of waiting for the Taobao man to arrive, the mouthfuls that followed were less and less enjoyable. We would undoubtedly recommend that our beer-loving readers try this drink, or something similar, but mainly to experience what we feel is one of the strangest tasting stouts out there. Combining such a wide range of reference points, from herbal spirits, to tonic wine, to stout and back again, this drink is a true Frankenstein’s monster. Prairie Bomb is available from Hangover Bar on Taobao at RMB125 per bottle. UPDATE (November 7, 2018 at 1.32pm CST): An earlier version of this article incorrectly attributed Bomb! beer to Moonzen Brewery. This story has been update to clarify that Bomb! beer is actually brewed by Prairie Artisan Ales. Sorry for any confusion this has caused. Cool off this summer by drinking cervezas and dining on some fresh ceviche at the Cevicheria Pop-Up Kitchen.